I decided that the cute Kaye Wiggs MSD-size dolls would be the perfect models for some very special dresses - ones that I would keep in my own collection. I have a box of old baby clothes from when my children were little, and none will ever be worn again. They have been in storage for over 25 years, and I didn't want to donate them to Goodwill. So, I've decided to remake some of those old baby outfits into clothes for some special dolls. I originally ordered a Kaye Wiggs Layla to be the model for the re-purposed baby clothes, but since Miki arrived, and she has the exact same size body, I couldn't resist re-making the first dress. 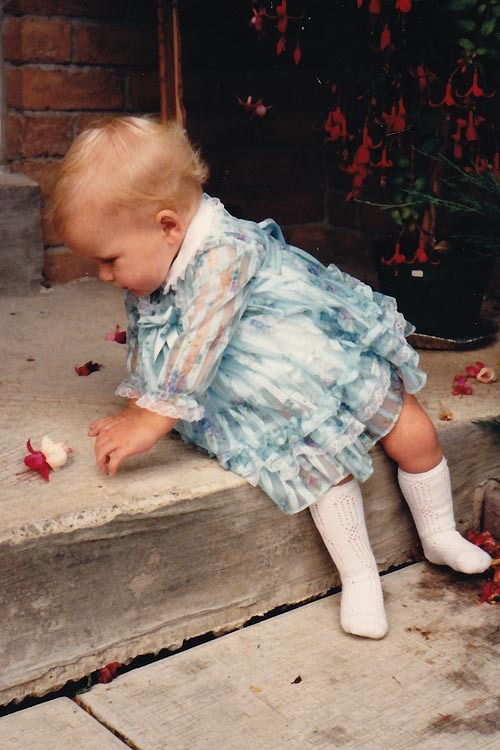 For my first re-purposed dress I chose one of my favourites - a ruffly blue dress I had made for Mary's first birthday. I picked the entire dress apart, which was difficult at first because of the sentimentality, but it got easier as I went along. All the ruffles needed to be made narrower, and everything for the doll dress was taken from the original baby dress. Even the collar was cut from the original, and I even re-used the snap fasteners. The blue ribbon is original too. I had originally thought that I might be able to make two dresses out of it, but there wasn't enough fabric - which might just be a good thing. Ensemble includes fully lined dress, fabric bow, and white tights.